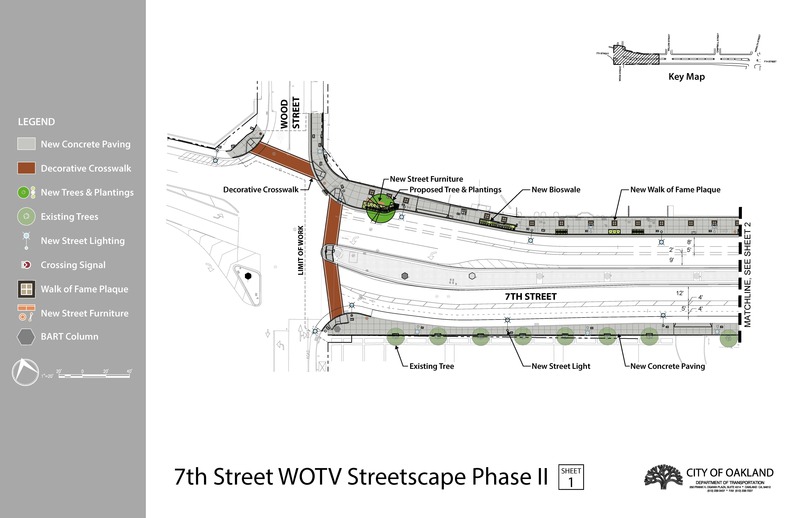 The 7th Street West Oakland Transit Village Streetscape, Phase II project will make street and sidewalk improvements on 7th Street between Wood Street and Peralta Street. This project will enhance the roadway with new sidewalks, trees, street lights, refreshed pavement, and added bicycle lanes. This project extends the streetscape improvements that were built in the first phase of the project, between the West Oakland BART station and Peralta Street. The project also connects with improvements on Peralta street between 7th Street and Prescott School. Construction for the project began in September 2018 and is and is anticipated to be completed in Summer 2019. During construction, 7th Street will be partially obstructed, but one lane in each direction will remain open for continued access. The City will make every effort to minimize inconveniences in the neighborhood and maintain pedestrian access. Fall 2018 – North side of 7th Street, Wood St. to Willow St.
Winter 2019 – South side of 7th Street, Wood St. to Peralta St. Early Spring 2019 – North side of 7th Street, Willow St. to Campbell St.
Late Spring 2019 – North side of 7th Street, Campbell St. to Peralta St.